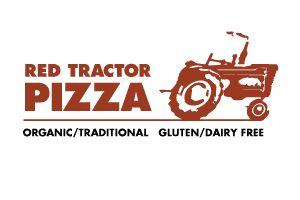 Red Tractor Pizza takes great care to make your pizza both delicious and good, serving sustainably-grown and raised foods with options for most diets and allergies. We start with the freshest, most-locally sourced ingredients, from our toppings all the way down to our crusts! We use local Montana Flour & Grains organic flour for our traditional crust and KAMUT certified organic grains for our sprouted-grain crust. Our house-tomato sauce is made from 100% organic tomatoes, seasoned with simple, whole ingredients. We source as many of our veggies and toppings as locally as possible, using in-season, organic produce when it's available including tomatoes, peppers, onions, garlic, squash, beets, brussel sprouts, spinach, kale, salad greens, salad veggies and micro greens, along with all the other rotating, seasonal produce our farmers are growing at the time! We are committed to supporting our local farmers and finding ways to include locally-raised, sustainably-grown organic produce into our foods. Our pepperoni is organic & nitrate free!...and all of our other meats are locally-sourced, grass-fed, humanely-raised, gluten and dairy free. Gluten Free? Our gluten free crust is made in-house with a proprietary blend of flour made from tapioca starch, rice flour, egg, xantham gum, salt, olive oil and sugar to get the yeast started . Our artisan gluten free crust is not the “cardboard” crust the poor gluten free friends have come to expect. On the contrary, it is supple and flavorful with a lovely crumb. No dairy. No potato flour. Dairy Free? We found the yummiest pizza cheese that melts just like real cheese. It’s made by our friends at Daiya! The vegan cheese is tapioca-based and has No Soy. No nuts. No Dairy. No eggs. Cow dairy free? Our friends at Amaltheia Organic Dairy provide us with the most delectable chèvre . Enjoy this organic cheese as a full substitute for our dairy offerings or as a compliment. Vegan? Our artisan pizza crusts are made from the simplest of ingredients in old-world style. The traditional hand-tossed as well as the sprouted multi-grain are both vegan (dash of honey used in our Sprouted Grain). No eggs. No dairy. No nuts. No soy. Other than our BBQ & Buffalo sauces, all sauces are gluten, egg, and dairy free, including our pesto, which is nut and dairy free. If you have any special dietary needs be sure to let us know!